We are honored to announce that Brigadier General John Adams, United States Army (Retired), has joined the Center for Climate and Security’s Advisory Board. Brigadier General John Adams retired from the US Army in September 2007. As the President of Guardian Six Consulting LLC, he assists clients in successfully analyzing national security issues and addressing US and allied national security requirements. He is a Ph.D. Candidate at the School of Government and Public Policy at the University of Arizona, focusing on comparative political economy. He has also served as an Adjunct Instructor in Political Science at the University of Arizona South, teaching a course in National Security Policy. His final military assignment was as Deputy United States Military Representative to the North Atlantic Treaty Organization (NATO) Military Committee in Brussels, Belgium, the highest military authority of NATO. He worked with military representatives of NATO and Partnership for Peace member nations to develop policy recommendations for the political authorities of the Alliance, and helped coordinate the transfer of authority in Afghanistan from U.S. to NATO control. Born and raised in the Washington, DC, area, General Adams was a Distinguished Military Graduate and received a Regular Army commission from North Carolina State University Army ROTC in 1976. 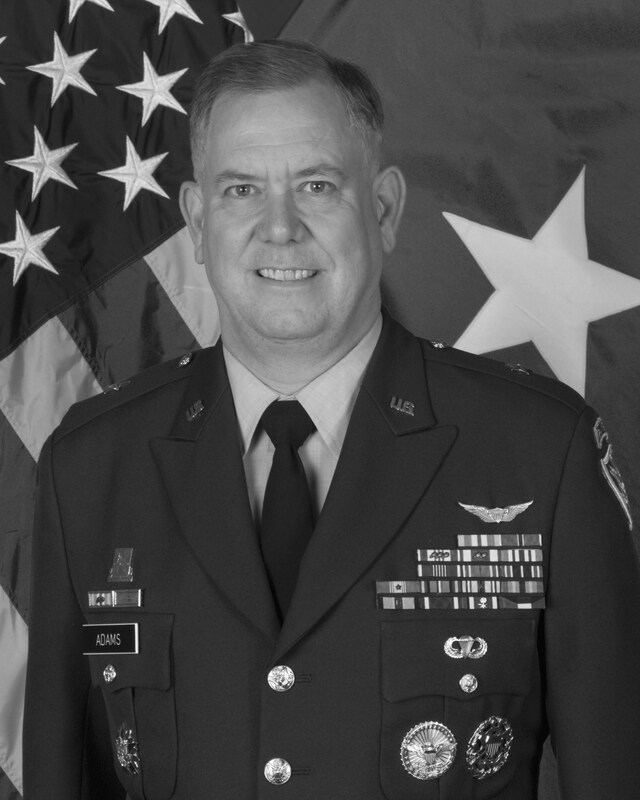 As a Foreign Area Officer, Military Intelligence Officer, and Army Aviator, his more than thirty years of service in command and staff assignments includes nearly eighteen years in Europe, Asia, the Middle East, and Africa, including assignments with US Embassies in Belgium (1994-1997), Rwanda (1996), Croatia (1998-2001), and South Korea (2002-2003). As an Army Aviator, he has more than 700 hours as pilot-in-command in fixed- and rotary-wing aircraft including the UH-1D, OV/RV-1D Mohawk, and RU-21 Guardrail Special Electronic Mission Aircraft. On September 11, 2001, he was stationed at the Pentagon as Deputy Director for European Policy in the Office of the Secretary of Defense, and participated in immediate disaster recovery operations at the crash site as well as coordinated international support for the US diplomatic and military response. He is a veteran of Operation Desert Storm (1991), Operation Guardian Assistance in Rwanda (1996), and served extensively on official business throughout the Balkans from 1998-2003. He traveled on temporary duty to both Iraq and Afghanistan in 2004. As a military attaché in Belgium, Rwanda, Croatia, and South Korea, he provided political-military advice to US Ambassadors, US Government authorities in Washington, visiting U.S. Government delegations, and represented the United States with foreign government officials regarding national and regional issues. Brigadier General (Retired) Adams’ military awards and decorations include the Defense Superior Service Medal (with Oak Leaf Cluster), the Bronze Star Medal, the Army Aviator Badge, Parachute Badge, and Ranger Tab. He was also the Distinguished Graduate of the Military Intelligence Officer Basic Course at Fort Huachuca in May 1977, and the Distinguished Graduate of the Officer Rotary Wing Aviator Course at the Army Aviation Center in January 1979. He is a recipient of the Military Intelligence Corps’ Knowlton Award and the Director of Central Intelligence’s Exceptional Human Intelligence Collector Award (as a member of the Great Lakes Crisis Team). He is a member of the Foreign Area Officer Association (serving as President of the Association from 2003-2004), Co-director of the American Nuclear Security Group, a member of the Consensus for American Security, a member of the Boards of the Tucson Committee on Foreign Relations and the Arizona Advocacy Network, a Life Member of the Veterans of Foreign Wars of the United States and the Military Officers Association of America, a member of the International Studies Association and the European Union Studies Association, and an Associate Member of the West Point Association of Graduates. He holds Masters in International Relations (Boston University), English (University of Massachusetts), and Strategic Studies (US Army War College). He taught English at West Point from 1988-90. He is proficient in French, Dutch, German, and Croatian. John first made acquaintance with Arizona while stationed at Fort Huachuca in 1977. He and his wife, Laura Magan MD, make their home in Tucson. They enjoy sailing, hiking, and cooking. He has two daughters, the oldest of whom graduated from the College of William and Mary in 2008 and is now studying toward a Masters in Public Health at Drexel University, and the youngest who graduated in 2011 from the University of Mary Washington, and now teaches English at James Madison High School in Vienna, Virginia. By Francesco Femia & Caitlin Werrell in climate and security on August 24, 2012 .